Going for Attack of the drones! In OL 1994 the official mascot was Kristin and Håkon. These non-intelligent IoT dolls got a huge success. We think an IoT doll that acts after your thoughts could inspire in training. This is especially nice for kids! They love dolls and even better if they interact with them. With the cheers from this doll, young athletes can perform even better! Our training doll mascot read the Alpha thoughts of the athlete. 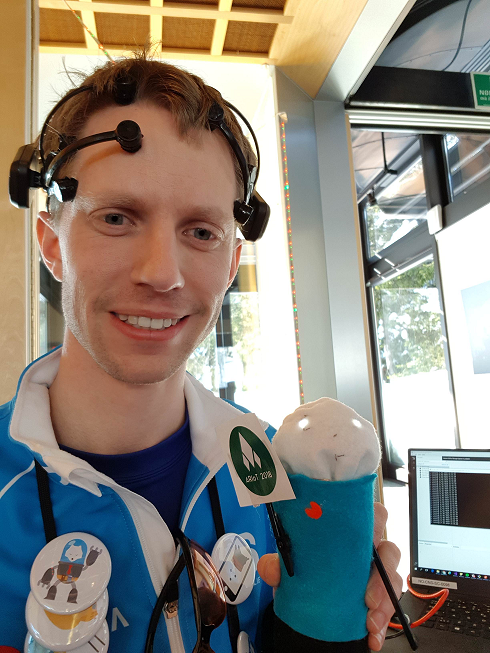 The alpha thought are the default relaxed and alert' mode of the brain (https://emotiv.zendesk.com/hc/en-us/articles/208378593-Frequency-Bands-what-are-they-and-how-do-I-access-them-) and send a signal to the robot, if they are high (the signals ... not the person). These triggers that the robot waves with a ARIoT flag. The doll has a battery pack that is included in the body that is possible to change. So this training mascot is possible to bring everywhere. The robot is built from scratch; cloth, paper, bottle and a lot of tailoring are the main parts. Wires are even sewn into the head, to power the lamps. It's smart because YOU are the brain! In the last gif you can see that the robot startes to wave when I am not relaxed!